Description: The Institute of Communication and Computer Systems (ICCS) is a private law body associated with the Department of Electrical and Computer Engineering of the National Technical University of Athens (NTUA). ICCS has been established in 1989, in order to carry research and development activities in the fields of telecommunication systems and computer systems and their applications in a variety of applications, such as electric power systems, software and hardware engineering, control systems and biomedical engineering. The Electric Energy Systems Laboratory (EESL) is one of the Research Groups of ICCS and offers various degrees of experimental training for students, as part of relevant courses. NTUA has participated in more than 40 research projects, most of which are collaborative EU funded projects. Smart RUE is one of the Research Groups of ICCS. It belongs to the Electric Energy Systems Laboratory (EESL) of the School of Electrical and Computer Engineering of the National Technical University of Athens. It was founded by Professor Nikos Hatziargyriou and operates under his supervision. It is composed of Professors, post-doctoral scientists, postgraduate students and highly specialized researchers and collaborators. It is technically and administratively supported by the personnel of EESL. The main activities of Smart RUE focus in research and technology development in the area of Smart Grids. The main Smart RUE activities deal with planning and operation of modern power systems characterized by high penetration of renewable energy sources, distributed generation and flexible loads. For the efficient solution of related problems advanced control and ICT technologies are employed. For more technical specifications and larger images, see here (PDF). Description: A main component of the laboratory is the single phase microgrid that includes a PV generator, a small Wind Turbine, battery energy storage, controllable loads and a controlled interconnection to the local LV grid. The battery unit, the PV generator and the Wind Turbine are connected to the AC grid via fast-acting DC/AC power converters. The converters are suitably controlled to permit the operation of the system either interconnected to the LV network (grid-tied), or in stand-alone (island) mode, with a seamless transfer from the one mode to the other. Part of the laboratory’s infrastructure is the 3-phase microgrid with main elements 3 single-phase battery inverters and micro-sources connected in each phase. Description: Lead-Acid, vented type, 30 cells, 2 V, 250/370 AH. Inverter: SMA/Sunny Island/4.5 kVA, bi directional, suitable for grid-connected and islanded operation. Description: Modules: 10 series connected - single crystal Si, 110W, 12 V per module. Inverter: SMA/Sunny Boy/1100W. Description: 3 phase axial flux PMSG, 850W. Inverter: SMA/Windy Boy/1700W. The wind turbine has been constructed at ICCS-NTUA lab. Description: The three ICCS-NTUA Microgrids form a Multi-Microgrid cluster (through Electrical and Internet connection) in order to investigate the development and verification of different control strategies and the impact of wide deployment of Microgrids at the distribution level. Description: Multi-agent technology has been implemented for the control of the distributed sources and the loads of the LV microgrid. The system is developed in the Java based platform called Jade and communicates with the DER/DGs via industrial communication protocols such as OPC. Furthermore the laboratory is equipped with 10 load controllers. These are embedded systems with Java Virtual Machine, multiple analogue & digital I/O as well TCP/IP connectivity. This system can be used to test in the laboratory or in a real test field various algorithms for distributed control of Microgrids and DG/RES. Some of the functionalities that can be tested are: market participation of the Loads or the DG/RES, formulation of a VPP, ancillary services provision, black start operation, islanded operation, multi-Microgrid operation and emergency load shedding. Description: The laboratory SCADA is implemented using a PLC (Programmable Logic Controller) system with LabVIEW/CoDeSys software. It provides measurements on the AC and DC side of the inverters, environmental measurements (irradiation, wind speed etc. ), control of the DGs and load profile programming. Description: The PHIL facility developed at ICCS-NTUA provides an efficient environment for studying interactions between hardware DER power devices and various simulated networks. A rack of the commercially available Real Time Digital Simulator RTDS® is operated. A Switched-Mode Amplifier by Triphase and a linear amplifier by Spitzenberger & Spies (PAS 5000) are used as a Power Interfaces between the RTDS and physical equipment to perform PHIL simulation. The Triphase power electronic converter platform allows the user to design in Matlab/Simulink the control algorithms. PHIL experiments are performed, where hardware equipment (loads, PV inverters, etc) are connected to simulated distribution networks. An irradiation sensor and an anemometer, provide input to simulated models in the RTDS in order to achieve realistic conditions. Description: A Switched-Mode Amplifier provided by Triphase is used as a Power Interface between the RTDS and physical equipment to perform PHIL simulation. The power electronic converter platform allows the user to design a Matlab/Simulink control model, upload it to the Target PC (converter’s powerful control unit) and connect the user’s PC to the Target PC to allow real-time control of and interaction with the inverter cabinet. It also can operate as a 3ph AC/DC power converter rated at 15kVA, allowing for active and reactive power flows control and provision of ancillary services (e.g. frequency and voltage support, power quality improvement etc.). Description: A linear amplifier with nominal power of 5kVA, capable of 4 quadrant operation and high bandwidth (DC - 5kHz). It can produce user-defined voltage and frequency profiles. It is used also as an interface between the RTDS and physical equpment to perform PHIL simulation. Description: RTDS Simulator is used for performing real time power system simulation. A Power Hardware in the loop (PHIL) simulation environment for DER power devices (e.g. PV inverters) has been developed. An environment for real-time simulation, analysis and validation of digital relay models has been developed for Control Hardware in Loop (CHIL) applications. Description: In the context of its involvement with microgrids and dispersed generation, the research group is active in the development and study of advanced control algorithms for power electronic converters (DC/DC, DC/AC, AC/DC/AC, etc.). 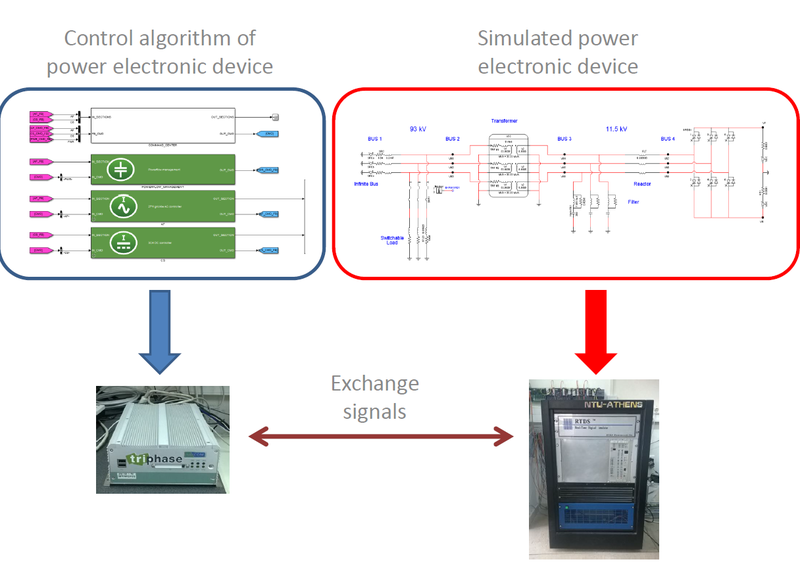 Based on the real-time simulator (RTDS) and a controller provided by Triphase, it is possible to thoroughly test control algorithms of power converters in an environment that reveals "hidden" weaknesses and faults in the design of these algorithms. Specifically, the design of the control algorithm is performed in the controller of Triphase while the power electronics are simulated in the RTDS. The communication between the two systems is achieved through analog and digital signals. Description: In order to study new protection problems arising, a laboratory adaptive protection system has been developed at ICCS-NTUA. 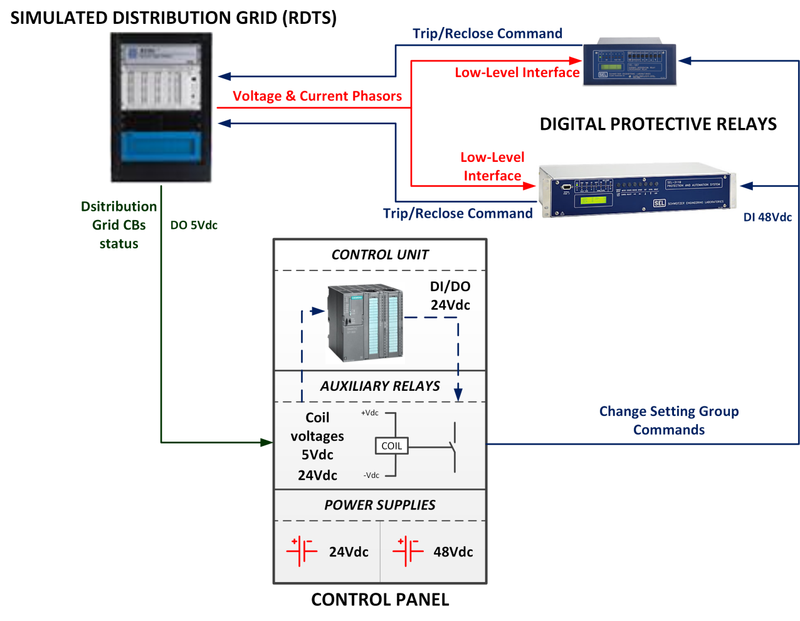 The electrical networks are designed and studied in the real-time digital simulator (RTDS). Through analogue and digital signals the RTDS is connected to external devices, such as the industrial protection relay SEL-311B. The relay is programmed to protect a feeder of the electrical network and receive voltage and current signals from the RTDS. It also controls the status of the simulated breaker in the RTDS while its condition is fed back to the relay. All relays have overcurrent elements with 2-6 setting groups that are used for the adaptive protection implementation. Description: The laboratory operates the necessary equipment to perform tests on photovoltaic inverters according to standards. The tests that can be carried out in the laboratory are: Static and Dynamic Maximum Power Point Tracking (MPPT) (EN 50530), EMC tests (IEC 61000-3-2, harmonic measurements 0-100KHz, etc. ), connection requirements (VDE-AR-N 4105), Fault Ride Through (VDE 0126-1-1) and anti-islanding requirements (in progress). Description: A three channel DC source with 3x10kW nominal power, used as a PV simulator which can simulate a PV string (characteristic V-I curve) and control environmental conditions (solar radiation, temperature). Description: A linear amplifier which an produce user-defined voltage and frequency profiles. It is used also as an interface between the RTDS and physical equpment to perform PHIL simulation. Description: At EESL the simulation of distribution network under future scenarios is thoroughly analysed. An integral part of this process are the Triphase’s Distributed Power Modules that realize a scalable, flexible and open platform for rapid prototyping of power conversion and power system applications. The setup consists of a 15 kVA bidirectional active frontend (DC/AC), and a 15 kW bidirectional DC/DC converter consisting of 3 channels. The Power Modules are fully reconfigurable and open. Description: Three channel DC/DC converter able to interface and fully control voltages and currents up to 3 different distributed generators and storage (e.g. Photovoltaics, Batteries, Super Capacitors). The power electronic converter platform allows the suer to design a Matlab/Simulink control model, upload it to the Target PC (converter's powerful control unit) and connect the user's PC to the Target PC to allow real-time control of and interaction with the control cabinet. Description: The bench testing rig allows for the testing of axial flux generators of power up to 9kW and maximum diameter of up to 1m. With the use of a 60 HP DC motor, a DC bi-directional drive and a tachogenerator, the axial flux generators can be driven at different and constant revolutions per minute (RPM). Different loads can be applied to the generators such as a grid-tie inverter for grid connection or a 12/24/48V battery bank for battery charging modes, along with a diversion load controller and resistive load. In addition, a three phase ohmic load of maximum power 3.3kW can be connected directly to the generator. The experimental setup mentioned allows for a complete analysis of the generator’s behavior under different situations. Description: The study and simulation of residential wind and hydro turbines for rural electrification applications follows local manufacturing which enables the user with the ability of local maintenance and immediate repairs of possible failures. In the workshop, small wind and hydro turbines are constructed from scratch. Up until now, residential wind turbines for battery charging and grid connection have been manufactured, with rotor diameters of up to 4.3 meters and a pico-hydro system of 500W. Anemometer, wind-direction meter, temperature meter, pressure meter, pyranometer etc. 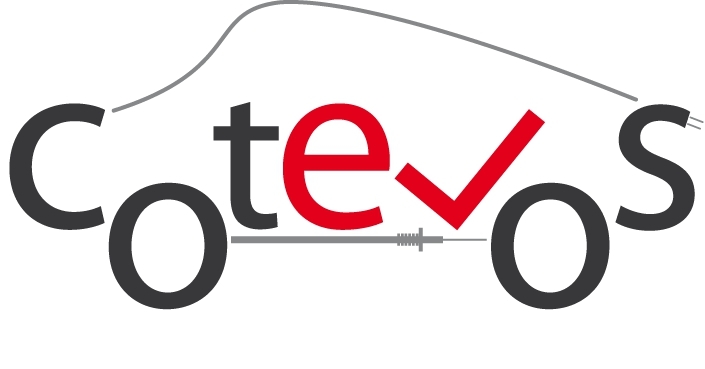 An EV (Electric Vehicle) emulator supporting the interoperability testing of the EV related protocols (IEC61851) is developed. It can be connected to an EVSE (Electric Vehicle Supply Equipment), as the device under testing, in order to validate its compliance with the standards. An EVSE emulator allowing the charging of a real or emulated EV in respect to IEC61851. The EVSE can also communicate with external stakeholders, i.e. the EVSEO, implementing the OCPP 1.5 protocol. Apart from the EVSE emulator, a commercial EV charging station (ETREL wallbox- 32A) is also available with smart charging capabilities. An EVSEO (Electric Vehicle Supply Equipment Operator) adopting the OCPP 1.5 protocol for the communication with custom-made or commercial EVSE. A custom-made energy management system with user interface offering several services to e-mobility stakeholders such as searching for EVSE location, electricity price information, EVSE availability, booking capabilities. The interaction between the EV user interface and the EVSEO is realized via Rest-Based Web Service technology. More installed equipment at ICCS. Description: An open-source discrete event simulator, used to simulate telecommunication networks. An OMNeT++ simulation model consists of simple modules implemented in C++ and compound modules defined using the OMNeT++ Network Description Language (NED). Description: Software framework for the development of intelligent agent, implemented in Java. JADE system supports coordination between several agents FIPA and provides a standard implementation of the communication language FIPA-ACL, which facilitates the communication between agents and allows the services detection of the system. Description: Software of the Real Time Digital Simulator (RTDS®) and it consists of power system libraries and control libraries. RTDS is used for performing Controller HIL and Power HIL simulations. Description: Software for solving optimization problems. It consists of a language compiler and a stable of integrated high-performance solvers. GAMS is tailored for complex, large scale modeling applications, and allows you to build large maintainable models that can be adapted quickly to new situations. Description: Software for accurate and reliable simulations of power systems dynamics. Performance of Power Hardware-in-Loop testing of DER devices integrated with the RTDS simulator. MIMO PHIL tests can also be performed using the two power amplifiers of the lab. CHIL applications with the RTDS simulator and an external Triphase Target PC which al-lows the design of the control algorithm in Matlab/Simulink and it’s testing in real time. Testing both local and remote by Multi Agent System (MAS) technology and performance of optimizations. Fast testing of developed control algorithms (Matlab/Simulink) in flexible hardware power electronic converters (DC/DC, DC/AC, AC/DC/AC) provided by Triphase. Power curve measurement of Small Wind Turbines. Small wind turbine generator testing. Testing and validation of DG components within the Microgrids operation. Testing commercial or custom made e-mobility products for their compliance with EV standards/protocols (IEC61581, OCPP). Developing and testing EV smart management algorithms in lab environment (microgrids). Testing and validating EV integration within simulated distribution network in the RTDS. PV inverter testing according to standards. Testing of protection schemes with the RTDS. Steady state and dynamic simulations of power systems with high RES penetration: using various in-house and commercial packages. 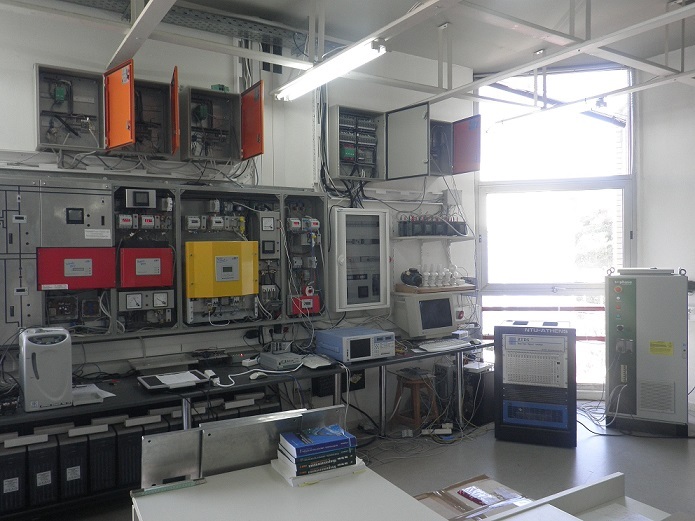 The laboratory SCADA supervises and controls the main components of the two laboratory microgrids. The one-phase microgrid consists of two SMA PV inverters, one SMA battery inverter, one wind turbine and loads of 15 kW. The three-phase microgrid consists of three battery inverters. SCADA acquires all the main AC measurements (Voltage, Current, Power etc) of the Microgrid components via DEIF power-meters using Modbus communication protocol. SCADA is capable to control the loads via a PLC and acquire the DC measurements of the microgrid components. In addition, SCADA controls the production of the RES via UDP and TCP communication protocols. All data is stored in a MySQL database. Metering data security and personal data protection: According to Article 10 of Directive 2012/27/EE by 25.10.2012, HEDNO (Hellenic Electricity Distribution Network Operator) has taken care of the distribution and statistical analysis of metering data in accordance with the principle of transparency and the protection of consumer’s personal data. In addition to the above, HEDNO has also taken care to the complete implementation by 09.03.2012 Commission Recommendation (2012/148EE) in accordance with the existing Union and national origin regulatory framework for the protection of personal data (see Article 8 of the Chart of Fundamental Rights of the European Union, Directive 2006/24/EC, Directive 2002/58 and Law 2472/1997). The security of the metering data is achieved with its transfer through private channels of communication (VPN) and leased lines of Communication Providers, while passwords encrypted with SSL certificate are used in the Web application. IEEE Transactions on Power Delivery, Volume: PP, Issue: 99, May 2016. Presentation in Panel at the IEEE Power & Energy Society General Meeting 2016, Boston, July 2016. IEEE Transactions on Smart Grid, vol. 7, no. 6, pp. 2913-2922, Nov. 2016. In Power Systems Computation Conference (PSCC), 2016 (pp. 1-7). Power Systems Computation Conference, June 2016. SEERC Power Conference, Portoroz, Slovenia, 7th—8th June 2016. 13th International Conference on the European Energy Market (EEM), Porto, 2016. 10th Mediterranean Conference on Power Generation, Transmission Distribution and Energy Conversion (MedPower), Belgrade, 2016. Electric Power Systems Research, Volume 140, Pp. 107–115, November 2016.